In a special interview with Arunachal24 , Arunachal Pradesh Chief Minister Pema Khandu stated that there must has been some developments in China which have caused the water flowing in Siang river to turbid and of unnatural colour due to excessive sediments. 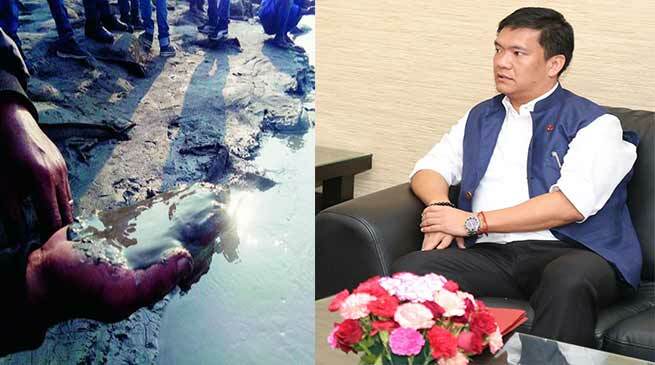 Khandu told Arunachal24 that “I went to the place where the Siang river enters Arunachal Pradesh and it was clear that there was abnormal amount of sediments in the water that has caused a changed in its colour. If the waters of Siang are turbid and unnaturally coloured before the river enters India then it is pretty clear that the reason behind it is not in India but in China. It is therefore now important to find exactly what has caused the waters of Siang to change colour. In other words, we must found out what happened in the river’s course in China, which is infact trying to hide the same”. Khandu also said that a district level investigation of the Siang’s water was done recently and the deputy commissioners of the districts said that the sediments in the water is similar to cement or other construction material and hence the water is not safe for use. Khandu also took the opportunity to tell us about his constant collaboration with the central government regarding the matter. Officials from the Union ministry of Water resources have also collected samples of the river’s water for investigation. It must be brought to light that the change in Siang’s waters were first noted in Goling, situated in North Siang district. This is the same point where the river enters India. This change in the Siang’s water has also caused a fall in the arrival of migratory birds in the Doing Irring Memorial Wildlife Sanctuary. There have also been reports of a large number of fishes ending up dead from several areas. The Siang river before entering India, flows through Southern Tibet as Yarlung Tsangpo and upon entering Assam from Arunachal Pradesh it flows as the river Brahmaputra. The issue of Siang’s water becoming unfit for consumption has been raised in front of China by India. In India people has blamed construction projects being carried out along the course of the river in China as the reason behind the problem with China denying all accusations and denying any responsibility. Speaking on the issue of the Siang river, Union ministry of external affairs spokesperson Ravish Kumar said recently that “It is a matter of grave concern for us. We are in contact with the ministry of water resources regarding the matter and are investigating several pieces of evidence”. External affairs minister Sushma Swaraj has also raised the matter infront of China’s foreign minister during a recent visit. There are already existing agreements in place between the two nations where such issues could be raised bilaterally. Who will remove the curtain from the vehicle ?